This flag should have been flown only when the High Commissioner was afloat. The Union Flag would have been the usual flag on land. The shape of the crown was unusual for a British flag. Nozomi Kariyasu's scan of the Palestine High Commissioner's badge is the official design which would have been surrounded by the standard green laurel leaf garland on a Union Flag. Approved by High Commissioner 17th July 1935, published as part of 1936 amendment (No.5) to Drawings of the Flags of All Nations 1930, discontinued 15th May 1948. The badge that was actually in use in 1948 was more like this scan. This is a reconstruction based on the flag flown on the High Commissioner's launch as shown in a black and white news-reel. The garland should be thicker than in the drawing, I presume that it would have been green, and the crown yellow. British Union Flag 1:2 defaced in the middle with white disk containing the badge and encircled with green garland. 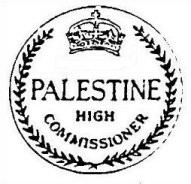 Badge consists of a yellow crown (untypical for British crowns) below which is inscribed in serif font in three rows 'PALESTINE HIGH COMMISSIONER', the lower row being curved. The actual badge as shown on David Prothero's scan and the one in Flaggenbuch 1939 are more then very similar  I cannot see any difference. The shape of the crown was unusual for a British flag. (...) I would be interested if anyone can identify the style of the crown which is not a Tudor/Imperial crown and unlike any other that I have seen. It is similar to that of Henry VII (1485) as drawn in Neubecker 1977 page 171. Initially I thought that the crown on the badge might intend to represent that of some (English) Crusader king. I have carried minor research and I believe the crown has no heraldic or historical support. The appearance of the crown, the way the pearls on the arches are represented, the lack of colour (all yellow) etc. certainly makes it look like a crown on a medieval seal. However, according to Fox-Davies 1996 who quotes in full a text on English crowns by Cyril Davenport F.S.A., an expert on the subject, the first English king to use a crown with crosses-pattée was Henry VI, and the first to combine these with fleurs-de-lys was Henry VII, both long past the times of Crusader dominion over Palestine.